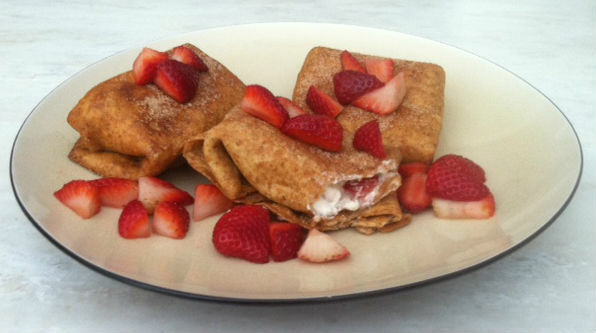 Strawberry Cheesecake Chimichangas…a match meant to be. This past weekend was very productive when it came to trying new recipes. On top of the Buckeye Cookies, I tried my hand at making bagels. Hubby and I have been eating Panera’s Asiago Bagels every morning for the past several months. We agreed that we could have them daily, and not get tired of them. However, we wished that they were whole grain asiago…thus causing us to make the decision to do our own homemade bagels. I did have another success in the kitchen, though. I tried the Strawberry Cheesecake Chimichangas that are from Just a Taste. They…are…delicious! The batch makes 6 strawberry cheesecake chimichangas and there are only two left 24 hours later. Those probably won’t make it until morning. The insides are creamy with just the right amount of sweetness and a crispy outer shell to encase the wonderfulness. Then there are the strawberries, that just kind of tie it all together and make everything right in the world. They are fairly easy to make. I would definitely recommend the candy thermometer, though (or deep-fry thermometer) to get the oil at the right temperature. The instructions are straight from the original website.